If you want to set your summer up for success, you’ve got to start by saying “no”. It’s fun to dream about all these amazing things you want to accomplish during the summer months, but the reality is that overextending yourself and packing your schedule so full with “fun stuff” doesn’t make for a fun summer at all… it makes for an exhausting summer. So, we’re going to kick off this series with a little pep talk on clearing the calendar clutter. If there is only one post you have time to read in this week-long series, let it be this one. Because it’s the most important thing if you want to be intentional this summer — and really, in all of life. What do you want to accomplish this summer? What do you want to look back on and remember from this summer? Only you can answer these two questions. No other person can answer them for you. So make sure that how you answer them is based upon what’s really true, not based upon what someone you admire in your mom’s group or some blogger online is doing. Once you’ve figured out honest answers to these two questions, come up with a succinct mission statement for your summer. This mission statement is the basis for why you’re doing everything you’re doing this summer. You’ve got to know what is important first before you can determine what is unimportant. Your mission statement doesn’t have to be some amazingly written and detailed paragraph. In fact, in most cases, the simpler you can make it, the better. Once you’ve created your mission statement, it’s time to establish some boundaries to guide you as you determine what you’re going to spend your summer doing. This means you’ve got to get good at saying “no” — not because you’re hard-nosed, but because you want to be able to say “yes” to what’s most important for you this summer. When you start saying “no” to what doesn’t matter as much right now so that you can say “yes” to what matters most, you no longer feel like you’re just running through your days barely surviving from one to the next. Instead, you’re living with purpose and intention — and this brings so much more fulfillment and peace! We will only plan a maximum of two activities per day. We will be home by 7 p.m. every evening. We will eat dinner as a family at least five evenings each week. We will stay home at least 2 whole days each week. We will have media free afternoons. Now keep in mind that these are just examples. You need to do what works best for your own family. But hopefully these ideas will get the wheels of your brain turning. Personally, since my goal for this summer is to rest and refresh, I’m cutting back on my personal and business commitments and goals and allowing a lot more margin in my day for fun family things, reading, and just kicking back and soaking up life. I’m also taking an extended break from traveling (except for family vacations). Every summer we’re bombarded with fun choices: weddings, barbecues, VBS, playdates, swimming lessons, tee ball, vacation…you know how the list goes on and on. Some things are fun activities we want to do and some are volunteer commitments and family obligations. All of these ideas are good when you think about them individually, but if we’re not careful we end up at the end of the summer without taking any time to just play in the backyard and enjoy some quiet time. This year we decided to be more intentional. We made a list of the top things we want to do this summer. Whenever another opportunity comes along we weigh it against the list. We ask ourselves if this is something we want to do more than the other things on the list. If yes, we give up something on the list. If no, we don’t put it on our calendar. Sometimes it’s difficult to make the choice to turn down something that sounds fun, but it really has helped keep our calendar clear just in the last two weeks! Our family loves to make a joint Bucket List like this for summer. We meet together at the beginning of summer and decide what our priorities are for the summer. Then, we each get to choose 2-3 things we’d really like to do that summer. We compile this list into our master bucket list and then plan out each request on our calendar over the summer months. So long as you don’t have 15 kids, this idea works pretty well and keeps the summer simplified. Best of all, it means that everyone gets to have some input on summer activities and that there’s a little something for everyone. If you’d like to do something similar at your house, you can print a free from Motherhood on a Dime. What is your mission statement for this summer? What boundaries are you going to set? Looking for more? 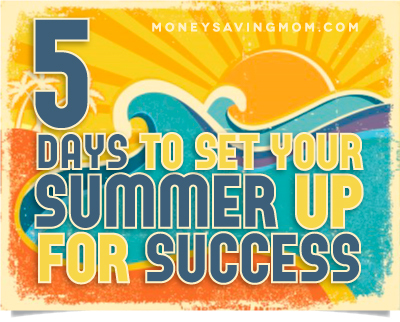 Read more posts about 5 Days to Set Your Summer Up for Success. Well, yeah its too late for me. Activities are schedule, paid for and we are in the thick of them already, but in the name of simplification we did NOT do a bucket a list, that created a lot of disappoint last year. We do come together on Sunday and talk about one small fun thing we will do the upcoming week. I REALLY struggle with the simplicity of summer because as a teacher, I try to cram a year’s worth of OTHER STUFF into about 6 weeks, but you are right. It is exhausting. Good for you to not do a bucket list. I’m proud of you! And I applaud all teachers out there… as I always say, I think you have one of the hardest jobs out there! I can only imagine how difficult summer must be since there’s so much you have to try to get done before the new year starts up again! I am so much of a go with the flow mom in the summer. We have such a structured life with homeschooling and other things that when the summer hits I am really ready for a break. But this year I think I will let the kids pick out some activities we can do once a week. So we get to fit in fun activities with the need to do things like canning and gardening. That’s great advice. Getting priorities down on paper always makes things clearer in our heads, I think, which certainly helps us identify when we’re overstepping our boundaries. One strategy I’ve found particularly useful lately is to allocate half-hour blocks to each task I need to achieve each day. In the morning I write a list of what I need to get done and then prioritise that list according to my overall goals (and thanks to your post, Crystal, I’ll be making some summer specific goals now, too). Often there’s things that carry over from the previous day. I then decide how much time I need to get everything done versus how much time I have that day, make a compromise if need be to ensure plenty of down time, and then get to it. It helps me to feel like I’m moving forward with my goals and gives some order to the mountain of things we invariably have on our to-do list. I find it also motivates me to get the things done that I don’t really want to do – boring stuff like washing or ironing – because I know I only have to do it for half an hour. It’s really surprising how a little step of progress each day actually gets a lot done overall – and leaves you with plenty of free time to enjoy the summer sunshine. Thank you for linking my summer bucket list. And thank you for saying that we moms don’t have to run from one edge of the earth to the other and spend all summer frazzled with ideas and activities. I enjoy just taking a walk with the kids as much as I do doing a massive project with them. I make a list each summer and if we accomplish half of them I’m so proud. We created our bucket list, and are off to a good start. One child wanted to go explore caves. At first I did not know how this would happen, then my husband found out he was getting a rare 4 days off in a row and a summer bonus, we pounced on the combined blessing and booked a camp spot at a state campground a days drive away near a caving sight that does tours. If I had not been intentional this year about sitting the whole family down to make a summer bucket list I would have never known my son wanted to go caving (he is a very quiet child and rarely speaks up about such things) nor would we have been so intentional about my husbands 4 days off. I made a summer bucket list of sorts… It’s more a list of ideas for the summer that includes things for sunny days, rainy days, activities, etc. It was important to me to do a VBS, have swim lessons for all 3, since we plan on being in water a lot this summer. And my son does karate once a week. My daughter loves gymnastics but we skipped the winter and spring sessons. We found alternative places that do a fantastic job and the cost is minimum!!! We cut out any other sports, like soccer for 2 reasons- the cost for two kids is a lot and it requires twice a week at times when we wouldn’t be able to do some other things we’d like to. If you can print a calander I would suggest putting the activities on that with the days/times. Because even though I thought I was simplifying my June looks busy once everything was laid out. I also put things on the bucket list that are simple like lay on a blanket and watch clouds! I can’t tell you how excited my kids are about that one!!! I also put on there old fashion relay type games. The things I did as a kid. Oh, I wanted to add that we are also planning on my six year olds being in charge of making dinner one night each. They will plan the menu, buy the ingredients and help make their menu! They like to help in the kitchen so I thought it would be fun to give them more say in a meal and they are loving the idea. That’s a great idea! My mom let my brother and I each do that every once in a while when we were young, and we absolutely LOVED it! We thought it was so cool to do everything ourselves. When we were a little older, my brother and I worked together to do some dinner parties for a 2 or 3 couples. This is a great idea. I was just sitting down to tweak my list of summer goals. I think I’m realizing that I need to trim down my list, because I have way too many things I’d love to accomplish. One thing that is helping me is that I made a grid with each week of the summer, and I’m starting by writing in fixed activities and obligations. Then I’m mapping out which week I might like to accomplish each goal. When I get more specific like that, it becomes much easier than my list of goals is too ambitious, and I need to trim it down some. Um, aside from cheer classes and two weeks of vbs, I need stuff to do this summer. I never have over scheduled anyway. Maybe some ideas of things to do for us to do is in my bucket list. That’s a good problem. 🙂 I’m going to do a post later this week on Summer Boredom Busters that you might find helpful. 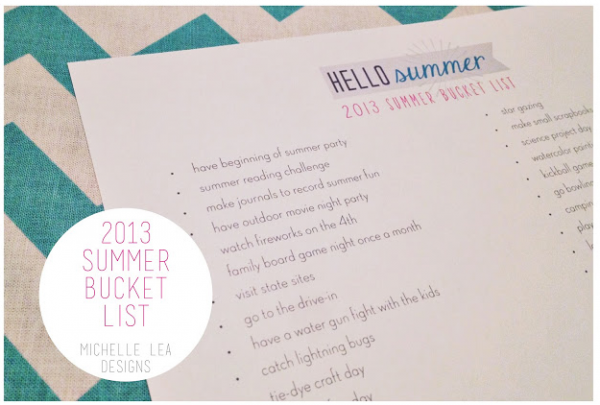 And definitely check out the links I shared on the Summer Bucket Lists — lots of ideas there! You can also check by typing in summer bucket list. But don’t get overwhelmed. Just pick what would work for you. I was really looking forward to the summer. I’m a teacher and have been suffering severe morning sickness, so the idea of a whole summer, feeling okay, and hanging with my kids at the pool every day was Heaven. BUT, my 7 year old just broke his leg, and now has a cast which can’t get wet. Anyone have fun ideas we could do so he can enjoy his summer too? Thankfully it should just be 4 weeks, but I want him to have fun for those four weeks. I live in Phoenix, which means my summer schedule probably looks more like most people’s winter schedule. Lots of indoor activities (atleast while the sun is up)! I am trying to be intentional with the time anyway though. We are hoping to move soon (just across town) so my indoor activities are focused on removing useless items from our home, shredding old papers, etc. I’m also trying to wrap up old projects that I started (or in some cases just intended to start). So I guess our theme for the summer is wrap up the old to pave way for the new! 🙂 I don’t want the old stuff to clutter up our new home, so it’s time to deal with all the undealt with stuff! Each day I’m trying to do 1-3 things that help accomplish that theme. Today I made an appointment with a seamstress that I trust to work on turning my wedding dress into a Christmas tree skirt. I’m excited! I’ve been intending on doing this for over a year. Now I have an appointment to get it started on Friday. I don’t want the big dress in the closet of our new home. I also put three useless things into our donate box before I left for work this morning.